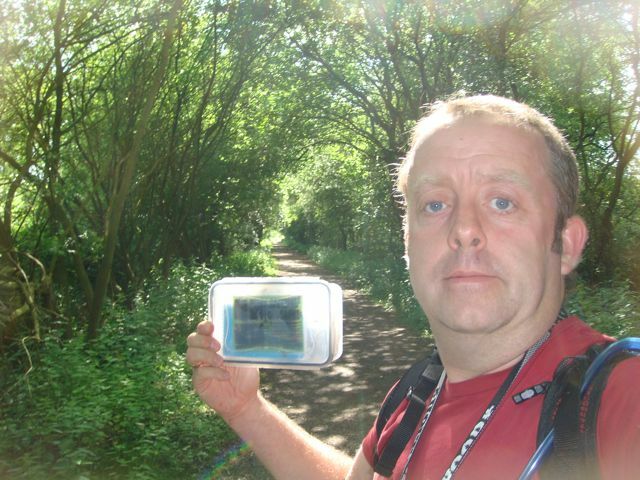 On Sunday, I’d finished logging Saturday’s caches and was at a loose end. The weather was still beautiful so I thought I’d pop out and find the new series which is set along the old Gnosall to Stafford railway line. This was converted into a really nice cycle-way / walking route as part of the year 2000 celebrations. I set off in the Jeep and parked up in Gnosall by the start of the path. I got my bike out of the back of the Jeep and off I set. The first cache was muggle-central so I thought I’d leave that one for the return journey, when hopefully it might be a bit quieter. From there on in, I had a series of easy finds. All but two of the caches were fake rock micros which made me smile as Isaac’s guitar teacher, who caches as XL5, set a few caches in the area using fake rocks and it seems the idea has caught on :-). I was thoroughly enjoying the cycling and all too soon I was passing under the M6 and near the end of the trail. Once I’d found all the main trail caches, there were two other ones near to the Stafford end which I cycled up to for yet more easy finds. On the return journey I cleared up one I could not spot earlier, then went non-stop back to the first cache in the series. Thankfully the area was deserted on my return so I had another quick find. A really good fun hour and a half or so and 14 finds.